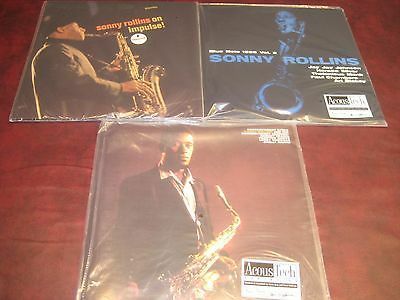 SONNY ROLLINS - CONTEMPORARY LEADERS AUDIOPHILE 45 RPM SEALED 2 LP SET LIMITED EDITION LOW NUMBERED #138 OF THE 1000 PIECES EVER PRESSED. Using only the original analog master tapes, the renowned team of Steve Hoffman ON 3 OF THESE TITLES & Kevin Gray remastered and cut all of the titles at AcousTech Mastering, which features a pure Class-A disc-cutting system. AcousTech is located at Record Technology, Inc. the plant where the vinyl was pressed. It is a tremendous sonic advantage to have the pressing plant plating department & mastering room in the same facility as Steve & Kevin could cut a lacquer and plated immediately. This prevents the degradation of the grooves in a lacquer which is very fragile to quick deterioration. And of course cutting at 45 speed is the audiophile choice for the highes quality. A 45-RPM record is sonically superior to a 33 1/3 variety because of a 35 percent reduction of groove curvature compared to a 33 1/3 cut.. It means that while you can't fit as much music into a 45, the undukations of the groove that your cartridge has to track are stretched over a longer distance. For these reissues, the music was displaced onto four sides, meaning each side contains about 10 minutes of music. This is the ultimate reissues. The only way you'll get closer to this classic music is to listen to the master tapes or have been in the studio with the artist originally during the actual session. E-BAY STORE. FOR YOUR INDIVIDUAL 45 SPPED SELECTIONS - INDIVIDUAL TITLE INFORMATION OR INDIVIDUAL PURCHASE JUST HIT THIS STORES TAB >. & TYPE IN 45LP OR SONNY ROLLINS INTO THE SEARCH FIELD WITHIN OUR STORES SECTION AS YOUR PERSONAL CODE FOR ALL INDIVIDUAL TITLES + INFORMATION WILL APPEAR. Limited Edition 180 Gram, 45rpm 2LP Set! Only the 1st 1,500 Copies are Numbered! Cut by Kevin Gray at 45 RPM and packaged in extra-thick cardboard stock gatefold jackets! A persistently provocative set of standards: Sonny delivers along with Ray Bryant, Walter Booker, and Mickey Rokar. Sonny Rollins made some excellent recordings for Impulse in the mid-1960s, a time when his unassailable skills and acrobatic approach made him a leading saxophonist, and one of the few to rival John Coltrane. On Impulse has only five tracks, but each tells the complex, glorious story of Rollins' talent, especially in the stretched-out solos where his knack for inventively, endlessly de- and re-constructing is evident. • Only the 1st 1,500 Copies are Numbered! Outside of Paul Chambers, who was employed as Miles Davis’s bassist at this time, all of the other players on these April 1957 RVG Hackensack dates were leaders of their own renowned groups; a reflection of the respect they all shared for the date leader, Sonny Rollins. Besides Chambers, with Jay Jay Johnson on trombone, Art Blakey behind the drums and alternating pianists Thelonious Monk and Horace Silver, who both play on the now-famous version of “Misterioso”, the words All-Star seem almost demeaning to this conclave. The resulting recordings burst forth with confidence and enthusiasm, capturing a fire and passion usually found only with uninhibited live dates and not the constraints of a recording studio. Exceptional versions of “Poor Butterfly” and “You Stepped Out Of a Dream” elevate this record to monumental status. Victor Feldman, vobraharp on "You"
Import duties, taxes, and charges are not included in the item price or shipping cost. These charges are the buyer's responsibility. Please check with your country's customs office to determine what these additional costs will be prior to bidding or buying. Note: It's illegal to falsify customs declarations or mark an item as a "gift" or lower it's value in order to avoid customs fees. INTERNATIONAL BUYERS NEED TO BE AWARE OF THE CUSTOM'S TAXES IN THEIR OWN COUNTRY AND KNOW THEY (AS THE BUYER) ARE RESPONSIBLE FOR CUSTOMS TAXES. FACTORY SEALED OUT OF PRINT PRODUCT is IRREPLACEABLE and therefore NOT RETURNABLE. International Buyers are responsible for their country’s Customs Fees. OUT OF PRINT PRODUCT is IRREPLACEABLE and therefore NOT RETURNABLE.